“One look at the Kodak Hall stage at Saturday’s Percussion Rochester finale told you all you needed to know about the balance of power. 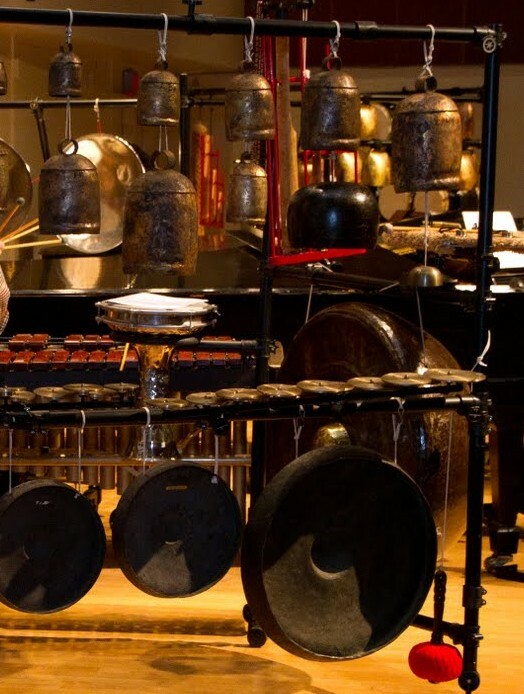 “With conductor Neil Varon at the podium, the percussionists extraordinaire of NEXUS – Bob Becker, Bill Cahn, Russell Hartenberger, Garry Kvistad, and honored guest John Beck -occupied large amounts of space in back with vast arrays of instruments. In between were the 55 student musicians of the Eastman Philharmonia. “There was plenty of melody and harmony for the youthful strings and horns to play, but the key to this piece was rhythm; the men in back were the rock stars. You can read the review in its entirety by clicking here. Michael Burritt’s new Duende Concerto for Percussion and Wind Orchestra was premiered on drums, hand drums and a new marimba that he has co-designed, and Netsky calls it “a tour de force in both composition and performance” saying “Burritt was a whirling dervish” and that his technique was “breathtaking”. The Eastman Wind Ensemble under the baton of Mark Davis Scatterday also performed “a superb rendition” of Leonard Bernstein’s Overture to Candide. Congratulations to all the performers on these wonderful accolades!